Pakistan/ Punjab/ Jhang district/ Athara Hazari - Pakistan Air Force Dassault Mirage 5 fighter jet crashed. The pilot ejected safely. Turkey/ Amasya Province/ 36 Km southwest of Merzifon/ Mecitozu-Konaklı - Turkish Air Force F-16 fighter jet from the 152th flying unit (5th Main Jet Base Group) crashed. The pilot ejected, but he received injuries. US/ TN/ Somerville/ NW of Fayette County Airport (KFYE) – An airplane impacted wooded terrain killing the pilot. Bolivia/ 5 km N of Trinidad – A Cessna U206G plane (CP-2793) crashed in a field killing all 4 occupants onboard. Malaysia/ Kota Baru/ Sultan Ismail Petra airport – A training Piper plane crash landed at the airport. The pilot suffered injuries to his hands and legs. Botswana/ Shakawe – A Cessna T210 Centurion II (ZS-SOD) struck a Marabou stork on approach. Both occupants were injured, the pilot seriously. The passenger managed to land the plane on the grass next to the paved runway with gear up. Indonesia/ Minahasa Utara waters – A Thrush 510P plane (PK-ELR ) belonging to Elang Nusantara Air crashed in Minahasa Utara waters. Both occupants are feared killed in the incident. Bahamas/ New Providence Island/ Nassau/ Caribbean waters SW of Clifton Pier – A Piper PA-31-350 Navajo Chieftain (C6-REV) crashed in the sea near Nassau, capital of the Bahamas, on Tuesday, killing a 77-year-old American passenger and injuring 10 others who were rescued. US/ AZ/ Mesa/ Falcon Field Airport (KFFZ) – A Nanchang CJ-6A plane (N4350D) went down off the departure end of Runway 22R around 4:20 p.m. (L.T.) after takeoff. No injuries. 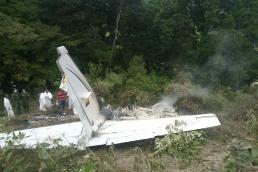 Mexico/ Yalcoc – A Cessna TU206G Stationair (XB-ITJ) crashed killing the 2 occupants. US/ UT/ North Salt Lake City – A Robinson R44 Raven II helicopter (N3234U) crashed into an empty industrial building. Both occupants died in the crash. US/ FL/ Wauchula/ Wauchula Municipal Airport (KCHN) – A Piper PA-46-310P Malibu (N933TK) experienced a loss of directional control and subsequent runway excursion upon landing. No injuries. Saudi Arabia/ Riyadh/ NW of King Khalid Int'l Airport (OERK) – A Cessna 340 (N340JC) ran out of fuel and crash landed injuring the 2 Americans on board. US/ WA/ Monroe/ Firstair Field Airport (W16) – A Glasair Aviation Glastar aircraft (N265EP) experienced a runway excursion and came to rest inverted. No injuries. Ten people, including five children, were killed in a plane crash in Colombia on Wednesday minutes after its crew signaled mechanical problems. The twin-engine Piper PA-31-350 Navajo Chieftain (HK-4464) carrying eight passengers and two crew (Rafael Avila Lindo – pilot and Jhonatan Marquez Diaz – copilot) came down near Mariquita municipality in the central province of Tolima while trying to make an emergency landing at a nearby airport but crashed and burst into flames. The airplane was en route to Bahia Solano when the pilot radioed that he had ran into problems. Russia/ Moscow region/ Voskresensky District / near Chemodurovo - Russian Aircraft Corporation MiG MiG-29-KUB jet (204 black) crashed during a test flight in a residential area. Both pilots ejected and were taken to hospital. Later one of them died due to his injuries. Somalia/ Kismayu - Kenya Defence Forces (KDF) Northrop F-5 jet crashed while returning from a combat mission in Jamaame, in Southern Somalia. The plane was either shot down or crashed due to a technical malfunction. The pilot is missing. US/ FL/ Vero Beach/ Vero Beach Municipal Airport (KVRB) – A Cessna R182 Skylane RG plane (N756EB) experienced a collapse of the nose landing gear on landing. No injuries. Belize/ Belize City Municipal Airport (TZA) – A Cessna 208B Grand Caravan (V3-HHU) experienced a runway overrun upon landing and came to rest in the waters of the Gulf of Mexico. No injuries. Greece/ near Gavdos island/ 6 nm off the southern coast of Crete - A F-16D-52 Fighting Falcon fighter jet, belonged to 343 Squadron, 115 Combat Wing, Hellenic Air Force, crashed in the seaduring training flight. Both pilots ejected safely and were rescued. US/ NJ/ Sussex/ West of Sussex Airport (KFWN) – A Cessna 210-5 (N8296Z) experienced a loss of engine power and force landed to a field. The airplane came to rest inverted. Portugal/ Ponte de Sor – A training Schweizer 269C-1 (300CB) helicopter, registered CS-HFD, crashed killing the 2 occupants. US/ NH/ Brookline/ SE of Brookline Airport (NH16) – A training Cessna 150J (N50709) crashed Friday morning in a field off Russell Road, taking down power lines as it descended. No injuries. US/ CO/ Fort Collins/ Loveland/ Fort Collins-Loveland Municipal Airport (KFNL) – A Cirrus SR20 G2 (N407ND) landed hard and crashed injuring seriously the pilot. US/ WI/ Middleton/ Middleton Municipal Airport/Morey Field (C29) – A training Cub Crafters CC11-160 Carbon Cub SS plane (N471LS) crashed on landing and came to rest inverted. The pilot onboard the airplane received minor injuries and the pilot-related passenger was seriously injured. UK/ Norfolk/ 3 miles SSE of Cromer/ near Northrepps Airfield – A Team MiniMax aircraft (G-MYRG) crashed on approach. The pilot received minor injuries. Brazil/ MS/ Jaraguari – A Cessna U206F Stationair (PT-JSM) crashed minutes after takeoff from Campo Grande, MS. The two people on board suffered fatal injuries. South Africa/ Gauteng/ near the R59 in Henley on Klip - A Zodiac plane (ZU-BZK) crashed injuring seriously the 2 occupants. Russia/ Nenetckiy AO/ near Varandey/ Trebs-Titov – A Mi-8 helicopter (RA-06138) crashed on takeoff killing 2, injuring 5 people onboard. Russia, Moscow, Bolshoe Gryzlovo – A P2006T plane (RA-1334G) crashed injuring the pilot. Brazil/ Parana/ Parque de Exposicao de Terra Boa – A Robinson R44 Astro helicopter (PT-YHP) crashed on takeoff injuring the 3 passengers. The pilot was not injured. US/ WA/ Everett/ Snohomish County Airport/Paine Field (KPAE) – A Taylorcraft BL-65 plane (N27580) experienced a loss of directional and impacted two hangars. No injuries. US/ WI/ Minocqua-Woodruff/ Lakeland Airport (KARV) – A Piper PA-18-150 Super Cub (N41594) experienced a runway excursion and came to rest inverted. No injuries. Russia/ Aksin`ino – A training Tecnam P2006T plane (RA-1334G) crashed injuring the pilot. US/ AZ/ near Lake Havasu Lake Havasu City – A Fouga CM-170R Magister (N300FM) made an emergency landing in a desert terrain. No injuries. US/ MD/ 1 km (0.6 mls) NW of Gaithersburg-Montgomery County Airport (GAI) – Sage Aviation Embraer EMB-500 Phenom 100 corporate jet (N100EQ) crashed into a house on approach killing the 3 occupants onboard. A mother and her two young sons, one of them just a month old, were killed also when the private jet crashed into their two-story wood-frame home, which was engulfed in a fireball immediately. South Africa/ Munsieville/ Krugersdorp – A Beechcraft F33A Bonanza (ZS-KHE) crashed on takeoff killing the 2 occupants. US/ CO/ Weld County / near Platte Valley Medical Center – An Enstrom 280FX helicopter (N409LH) crashed while the pilot was attempting to make an emergency landing due to an engine trouble. The pilot suffered minor injuries to her wrist. US/ TX/ Mount Pleasant/ Mount Pleasant Regional Airport (KOSA) – A Cessna 152 (N787PB) clipped power lines and subsequently experienced a runway overrun. The airplane sustained substantial damage. Canada/ BC/ Pitt Meadows/ Pitt Meadows Regional Airport (CYPK) – A Cessna 152 (C-GZSX) crashed on takeoff. The pilot received serious injuries. US/ WY/ Jeffrey City – A Cessna P210N Pressurised Centurion (N4881K) impacted terrain during a go-around attempt at a private airstrip. No injuries. Venezuela - A Rockwell Sabreliner 60ELXM jet (XB-KLQ ) that violated Venezuelan airspace was "intercepted and immobilized" by military forces. France/ Rochecorbon – French Air Force Dassault Alpha Jet trainer crashed into a home for the disabled at Vouvray, France. Both pilots ejected safely. One person was killed and 5 were injured on the ground. US/ ID/ SW of Coeur d A'lene/ near Rockford Bay – A Great Lakes 2T-1A Sport Trainer biplane (N642RT) experienced a collapse of the left main landing gear upon landing. No injuries. US/ AK/ King Salmon/ King Salmon Airport (PAKN) – A Piper PA-31-350 Navajo Chieftain (N400RA) damaged its landing gear on takeoff. The crew diverted to King Salmon Airport (PAKN), in King Salmon, Alaska, where a collapse of the left main landing gear occurred. No injuries. Paraguay/ Caazapa Department/ Tavai – A Beechcraft Bonanza A36 plane (ZP-TAB) failed to gain height on takeoff and crashed into a fence. No injuries. Ecuador/ La Union – An agricultural Cessna T188C Ag Husky plane (HC-BOS) crashed. No injuries. US/ UT/ Wendover/ Wendover Airport (KENV) – A training Cessna 182T Skylane (N961GW) crashed while the plane was performing touch-and-go landings. Both occupants received serious injuries. US/ MO/ Springfield/ SW of Downtown Airport (3DW) – A Piper PA-32R-301T Turbo Saratoga SP (N3127R) clipped a cell phone tower then impacted trees and terrain while on approach. Two of the four occupants onboard received minor injuries. Iraq/ 78 mi N of Samarra/ Mutassem – Iraqi Air Force Eurocopter EC 635 T2+ (EC 135) helicopter was shot down by Islamic State militants. Both pilots died in the crash. 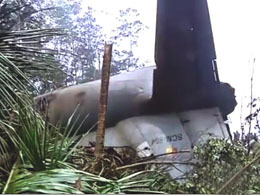 A Sri Lankan Air Force Antonov An-32, a twin-engine turboprop transport plane (SCM-864) with five crew on board crashed in the early hours in Athurugiriya, 18 kilometres from Sri Lanka's capital. The military aircraft was flying to Ratmalana, the domestic airport, from the country's main international airport in Katunayake. The crash may have occurred due to poor weather. The last communication from the flight was that the pilot could not see Ratmalana airport due to the poor visibility. Police said 4 of the crew members died and one survived. The crash damaged three houses but no civilians were injured. The captain of the aircraft Squadron Leader J.M.W.M. Abeywardena, co-pilot Flight Lieutenant A.A.D. Taranga Amaratunga, Flight Sergeant M.W.L. Priyantha and Corporal W.W.A.L. Wijerathna were the four people killed in the crash. The fifth person, L.A.C. Chathuranga survived the crash and is undergoing treatment at the Colombo National Hospital. He has received severe burns below the waist and succumbed to his injuries on 18 December night at the Colombo National Hospital. Switzerland/ Lucerne/ Beromunster/ LSZO Luzern-Beromunster Airport – A Cessna 182J Skylane (HB-CBZ) flipped over during takeoff. The 5 occupants onboard received minor injuries. US/ GA/ Saint Simons Island/ Brunswick/ near Malcolm Mc Kinnon Airport (KSSI) – A Murphy Renegade Spirit plane (N955R) crashed into a house killing the pilot. Brazil/ SP/ Buritama – A Robinson R-44 Astro helicopter (PT-YPW) crashed in a rural area injuring the 2 occupants. US/ LA/ Shreveport/ Red River/ north of Downtown Airport (KDTN) – A Beech S35 Bonanza plane (N635RM) force landed to the banks of the Red River, due to an engine failure. No injuries. US/ VA/ east of Calverton/ near Walnut Hill Airport (58VA) – A Titan Tornado II aircraft (N50402) crashed killing the pilot. Romania/ near the Black Sea/ Siutghiol Lake – An Eurocopter EC 135 helicopter (348) belonging to the emergency rescue unit SMURD crashed into an icy lake in southeast Romania killing the 4 crew members. US/ MS/ South side of Ellisville – A Slipstream Revelation experimental aircraft (N783QJ) force landed to cemetery terrain and came to rest inverted. No injuries. US/ TX/ Houston/ Sugar Land Regional Airport (KSGR) – A Piper PA-46-350P Malibu Mirage (N224JJ) experienced a runway excursion and subsequent nose gear collapse upon landing. No injuries. US/ MT/ Ronan/ near Round Butte/ WNW of Ronan Airport (7S0) – A Piper PA-18-150 Super Cub (N5989Z) impacted hillside terrain killing 1, injuring seriously 1 occupant onboard. Japan/ between Tochigi prefecture and off east of Ibaraki prefecture - American Airlines Boeing 777-223ER (N751AN) was hit by turbulence. At least 12 people out of 240 passengers and 15 crew members suffered injuries, and two among them are serious with broken bones. US/ KS/ Olathe/ Johnson County Executive Airport (KOJC) – A Beech A36 Bonanza (N1097Z) experienced a collapse of the nose gear upon landing. No injuries. Brazil/ Goias/ Farm in Nazario – An agricultural Embraer EMB-202 Ipanema plane crashed. The pilot received serious injuries. Turkey/ Cappadocia/ Guvercinlik Valley – A hot air balloon crash-landed killing a Chinese tourist. Six persons of Malaysian nationality were injured. The balloon was engaged in a sightseeing flight. South Africa / WCP/ Eden/ West of Mossel Bay – A Rockwell Commander 114 plane (ZS-JRP) crash landed after experiencing engine problems. Both occupants were injured. Egypt – A military plane crashed during a joint training exercise of the UAE Armed Forces and the Egyptian Armed Forces. The crew of 4 died in the crash. US/ TX/ San Antonio/ San Antonio Int'l Airport (KSAT) – A Cessna 310J (N700MA) experienced a collapse of the left main landing gear upon landing. No injuries. US/ TX/ Seagoville/ NW of Seagoville Airport (5TA9) - A Beech V35A Bonanza (N555SF) impacted rural residential terrain on approach. The sole pilot onboard received fatal injuries. Mexico/ Champoton – A Learjet 25D plane (N265TW) crashed in a rice field and burst into flames. Both occupants were killed. Taiwan/ 15 nm southwest of Taichung Airport – A Bell 206B-3 Jet Ranger helicopter (B-31019) suffered a loss of engine power and made a forced landing. Both occupants were slightly injured. Australia/ NSW/ 45km west of Moree Airport (YMOR) – An agricultural Air Tractor AT-502B plane (VH-PTF) struck a wall during an aerial spraying operation. No injuries. Portugal/ Pombal/ Santiago de Litem/ Quinta de Sao Lourenco – A Cessna 172 (CS-AKH) made an emergency landing to an agricultural field and flipped over. The 3 occupants onboard were injured. Brazil/ Mato Grosso/ Farm in Agua Boa – An Embraer EMB 202 Ipanema crop duster (PT-ULZ) crashed killing the pilot. France/ off Le Precheur – A Piper PA-28-181 Archer (F-OGHZ) crashed on approach killing a couple on board. Mexico/ near ejido Plan de San Luis – An agricultural Air Tractor (XB-JXX) flipped over on landing. The pilot was injured. US/ CA/ San Rafael/ San Rafael Airport (CA35) – A Thorp T-18 experimental airplane flipped over on takeoff. The pilot suffered minor injuries and declined medical treatment. US/ SC/ Calhoun County/ Congaree River/ NE of Gaston – A Mooney M20 made an emergency landing in the Congaree River. The airplane came to rest submerged. The sole pilot onboard received minor injuries. New Zealand/ Waitaki/ Papakaio/ Hilderthorpe/ SW of Oomaru Airport (NZOU) - A Rans S-6 ES (XL) Coyote II (ZK-RXL) force landed to a field and impacted a hedgerow. The sole pilot onboard received serious injuries. Brazil/ RS/ Porto Alegre/ Salgado Filho Int'l Airport (SBPA) - A Cessna 208B Grand Caravan (PT-MEX) was flipped over by severe wind gusts during a storm. Mexico/ Tijuana/ Parque Industrial Pacífico II – A Cessna 150 (XB-IKC) collided with an embankment during a forced landing. No injuries. Kuwait/ Camp Buehring – US Navy Sikorsky MH-60S Seahawk helicopter crashed. Three of the six crew members sustained minor injuries. Syria/ Quneitra province/ Hadar - Israeli Defence Force Skylark I drone was shot down by Syrian defense forces. Taiwan/ Taitung City/Taitung Airport (RCFN) – A training Dornier 228-212 (B-55565) made a belly landing. Thailand/ Yala province/ Muang district/ Kampung Poyak - Thai Air Force Bell 206 helicopter crashed in bad weather. The four occupants were injured. US/ CA/ Perris/ Perris Valley Airport (L65) – An experimental ASAP Beaver RX550 plane (N105JF) crashed shortly after takeoff. The sole pilot onboard received serious injuries. Bahamas/ North Bimini/ near South Bimini Airport (MYBS) – A Cessna 172M Skyhawk (N12182) ditched in the waters of the Caribbean Sea. No injuries. US/ TX/ Odessa/ Goldsmith/ NW of Odessa Airport-Schlemeyer Field (KODO) – A Cessna 172M Skyhawk (N9922V) crashed killing the pilot. China/ Shaanxi province/ Weinan – A military Xian JH-7A jet crashed killing the 2 occupants. South Africa/ Benoni – A helicopter made an emergency landing on a highway. The pilot only sustained minor injuries. Switzerland/ Zurich Airport (LSZH) – A Robinson R44 Raven II helicopter crashed on takeoff. No injuries. Mexico/ Morelos/ Tequesquitengo/ runway Vista Hermosa – A de Havilland Canada DHC-6 Twin Otter 300 plane (XA-UOA) crashed on the runway. No injuries. Venezuela/ La Bonanza – A Partenavia P68C-TC plane (YV1706) crashed in a mountainous area killing the pilot. Germany/ Rottweil Zepfenhan – A Fournier RF-4D motor glider (D-KOHU) crashed killing the pilot. Syria/ Raqqa - Royal Jordanian Air Force F-16A Block 20 MLU Fighting Falcon fighter jet was shot down by IS members and they captured the pilot. US/ CA/ Jackson/ NE of Westover Field/Amador County Airport (KJAQ) - A Cessna 172 (N8518B) crashed killing the 2 occupants. US/ MI/ Port Huron/ St Clair County Int'l Airport (KPHN) – A Piper PA-34-200T Seneca II impacted terrain while performing an instrument approach to the airport. The sole pilot onboard received fatal injuries. Colombia/ Santander/ near Piedecuesta - A Cessna T207A Turbo Stationair 8 (HK-4892) crashed in northern Colombia on Wednesday, killing all 6 passengers and the pilot, who had warned air traffic control of a mechanical fault moments before. Australia/ SA/ Adelaide/ Parafield Airport (YPPF) – A training Schweizer 269C-1 helicopter (VH-FTY) crashed. The instructor suffered a minor rib injury and was taken to Lyell McEwin hospital by ambulance. Sudan/ South Kordofan state/ Al-Shai'r area/ North of Kadougli - Sudan Armed Forces Antonov plane was shot down by rebels of SPLM-N. The victims of the crash included at least 6 officers. New Zealand/ Waikato/ 100 meters off Raglan Beach - A Piper PA-28-140 Cherokee (ZK-CNI) crashed shortly after takeoff into the sea. Two male occupants received moderate injuries. A woman onboard suffered serious injuries and was flown by air ambulance to a hospital. US/ TN/ Nashville/ John C Tune Airport (KJWN) – A Cessna 182P Skylane (N6063F) experienced a collapse of the nose gear and came to rest inverted upon landing. Russia/ Republic of Tatarstan/ near Nizhnyaya Maktama – Kazanavia Mi-2 helicopter (RA-15643) made a hard landing. US/ TX/ Granbury/ Pecan Plantation Airport (0TX1) – A Beech 35-C33 Debonair (N500HT) experienced a gear-up landing. No injuries. US/ CA/ Santa Rosa/ Charles M. Schulz/Sonoma County Airport (KSTS) – A Beech 35-A33 Debonair (N1111Z) experienced a collapse of the landing gear upon landing. No injuries. Chile/ Quidico – A military Airbus Helicopters BK117B-2 helicopter (C-20) was on flight looking for terrorists that previously had attacked a police car, when one of the crewmembers was hit with a gun in his chest. US/ MD/ Westminster/ Carroll County Regional Airport (KDMW) – A Pitts Special S-1S (N49294) collided on landing with a Piper PA-28-140 (N95297). The pilot of Pitts aircraft received injuries, while both occupants of the Piper were not injured. Brazil/ SP/ Bertioga – A Helibras HB 350B2 Esquilo helicopter (PT-HNC) crashed shortly after takeoff killing the 5 occupants. The helicopter had been involved in another accident in 2004. Mexico/ Zacatecas/ García de la Cadena – A training Cessna 150H (XB-IRC) crashed and broke up killing the 2 occupants. An Indonesia AirAsia Airbus A320-216 (PK-AXC), performing flight QZ8501, crashed into the Java Sea with 162 people on board, halfway into a Dec. 28 flight from Surabaya, Indonesia, to Singapore. Dozens of bodies have been recovered, and search teams have detected the plane's wreckage. At 06:12 the crew contacted Jakarta ACC, stating that they were deviating to the left of their planned route to avoid clouds. The flight also requested a climb to FL380. Last radar contact with the aircraft was at 06:18 hours Surabaya time. Of the 162 passengers and crew on board, 155 were Indonesians, with three South Koreans, one Singaporean, one Malaysian, one Briton and a Frenchman -- co-pilot Remi Plesel. 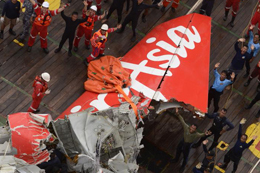 The mangled tail of an AirAsia plane with the flight data recorder were lifted out of the Java Sea. On Tuesday, 13 January 2015, divers lifted the second black box to the surface and took it to the navy warship Banda Aceh. The device was brought to Pangkalan Bun town, the search headquarters, before being transferred to a plane and flown to Jakarta. Officials say both black boxes are in good condition. The flight data recorder holds a wealth of information on many of the plane's instruments, while the cockpit voice recorder stores radio transmissions and sounds in the cockpit. While the cause of the crash is not known, the national weather bureau has said seasonal storms were likely to be a factor. Airbus A320 выполнявший рейс QZ8501 авиакомпании Indonesia Air Asia из Индонезии в Сингапур потерпел крушение в Яванском море недалеко от острова Калимантан (Борнео). Его обломки находятся на глубине 33 -37 метров. От этого места были подняты хвостовая часть разбившегося самолета и бортовые самописцы. Все на борту 162 человека погибли. Более 48 тел погибших извлекли из воды участники операции по поиску жертв крушения самолета у берегов Индонезии. Экипаж самолета приблизительно в 6:12 по местному времени (02:12 по Москве) послал диспетчеру запрос на увеличение высоты полета- набрать до 11,5 тыс. метров и отклонится от курса в левую сторону. Но в ответ экипажу разрешили только сменить курс влево и продолжать двигаться на той же высоте (9,7 тыс. метров), поскольку на запрашиваемом эшелоне находился другой борт. Как выяснилось, пропавший самолет компании AirAsia был застрахован той же компанией, что и два предыдущих малазийских «Боинга», - пропавший в марте над Индийским океаном с 239 пассажирами на борту (он до сих пор не найден) и рухнувший в июле под Донецком. Эту информацию подтвердили в немецкой страховой компании Allianz. По некоторым данным, сумма страховой выплаты по пропавшему Airbus-320 составит порядка 100 миллионов долларов. Столько же страховщику предстоит выплатить в качестве компенсации за потерю "Боинга" над Индийским океаном. За гибель 283 пассажиров „Боинга” под Донецком компания выплатит в качестве компенсации около 50 миллионов долларов. Кроме того, Malaysia Airlines может получить от компании почти 100 миллионов долларов за самолет. Жители острова Белитунг утверждают, что слышали грохот, похожий на звук взрыва, примерно в то же время, когда была потеряна связь с самолетом AirAsia. Чем может быть вызвана предполагаемая катастрофа, пока неизвестно. Возможно, всему виной непогода, ведь известно о сильной турбулентности, о которой говорил экипаж. Некоторые авиационные эксперты считают, что причиной крушения самолета авиакомпании AirAsia стал человеческий фактор. Airbus A320-216 (PK-AXC), на авиокомпанията Indonesia Air Asia изпълняващ полет QZ8501 от Сурабая, Индонезия, за Сингапур е паднал в Яванско море югозападно от остров Калимантан (Борнео). Останките му са открити на длбочина 33 -37 метра. От мястото са изведени на повърхността опашната част на разбилия се самолет и бордовите му самописци. Открита е основната част от фюзелажа. Няма оцелели. На борда се намирали 162 човека, като сред тях имало трима южнокорейци, сингапурец, малайзиец, британец и французин – пом. пилотът Remi Plesel, а останалите били индонезийци. Най-малко 48 тела на загинали при катастрофата са извлечени до момента на брега от издирващите екипи. Установена е самоличността на 34-ма от тях. Към 6:12 часа местно време екипажът на самолета поискал разрешение за увеличаване на височината на полета до 11500 метра и отклоняване от курса наляво. Разрешена му е промяна на курса, но му е отказана промяна на височината на полета поради това, че в същото време на този ешелон се е намирал друг самолет. Катастрофиралият самолет на компанията Air Asia бил застрахован в немската компания Allianz, както и предходните два злополучни самолета на Malaysia Airlines – изчезналият през март над Индийския океан с 239 души на борда (до момента не е открит и съдбата му е неизвестна) и сваленият през юли край Донецк. Говори се, че сумата на застраховката за падналия Airbus-320 е от порядъка на 100 миллиона долара. Жители от остров Белитунг твърдят, че са чули грохот като от взрив по време съвпадащо с това на изчезването на самолета на AirAsia от екраните на радарите. Засега не е известно какво е довело до катастрофата, а според хипотезите на експертите и водените разговори с диспечера предполагаемите причини са две – лошото време съпроводено със силна турбулентност и грешка при техника на пилотиране допусната от екипажа притиснат от екстремните условия на полета. Очаква се до 22 януари 2015, да бъдат разчетени данните от „черните кутии” и бъде публикувано предварителното заключение на експертите за причините довели до трагедията. Guyana - Air Services Britten-Norman BN-2A-6 Islander cargo plane (8R-GHE) with 2 crew members took off from Mahdia at 15:42 UTC (11:42 local time) on a routine local cargo flight to Karisparu, but it failed to arrive. The aircraft was declared missing. Congo (DR)/ 25 km (15.6 mls) from Uvira - Air Sirin Antonov 26 cargo plane (4L-AFS) departed Bujumbura and headed west, bound for to Pointe Noire, Congo. It impacted a mountainside just across the border in D.R. Congo killing all 6 crew members. US/ CA/ San Diego/ El Cajon/ Gillespie Field Airport (KSEE) – A Cessna 172RG Cutlass (N5167R) executed an emergency gear-up landing. No injuries. Ecuador/ Río Bobonaza – A Cessna 182E Skylane (HC-CDL) ditched in a river after takeoff. No injuries. Latvia/ Saldus/ Novadnieki – An experimental plane (YL-XIN) crashed shortly after takeoff killing the pilot. Australia/ southern Tasmania/ Port Arthur – A Cessna 172S (VH-PFT) crashed into the water, while its crew was filming yachts in the Sydney to Hobart race near the Tasman Peninsula. The 2 occupants onboard are missing. US/ FL/ Lantana/ North of Palm Beach County Park/Lantana Airport (KLNA) – A Robinson R22 Beta helicopter (N771MM) crashed. One person onboard was killed and another critically injured. Australia/ WA/ Bunbury/ Bunbury Airport (YBUN) – A Beechcraft 76 (VH-AHT) made an emergency landing due to a landing gear failure. US/ OH/ Port Clinton/ Erie-Ottawa Int'l Airport/Carl R Keller Field (KPCW) – A Piper PA-23-160 Apache G (N222CP) crashed upon takeoff. The pilot died in the crash. US/ TX/ Horeshoe Bay/ Horseshoe Bay Resort Airport (KDZB) – A Robinson R44 Raven II helicopter (N174CD) crashed on landing in gusting wind conditions. The sole pilot onboard the aircraft received minor injuries. Brazil/ Mato Grosso/ Fazenda Nova Esperanca-Primaver do Oeste – An agricultural Embraer EMB-202 Ipanema plane crashed injuring the pilot. Nepal/ Kathmandu-Tribhuvan Airport (KTM/VNKT) - Jet Airways Boeing 737-85R (VT-JBH), flight 9W268 from Mumbai, India to Kathmandu, Nepal experienced bird ingestion on approach. US/ NM/ Vaughn/ near Vaughn Municipal Airport (N17) – A Piper PA-28-181 Archer III (N2558M) crashed killing the 2 occupants. Pakistan/ Lahore-Allama Iqbal International Airport (LHE) – A Shaheen Air Boeing 737-4H6 (AP-BJN) sustained damage in a runway excursion accident. After landing on runway 36L the airplane went to the right off the side of the runway. It came to rest in the grass with a collapsed left hand main gear. No injuries. US/ FL/ Fort Pierce/ St Lucie County Int'l Airport (KFPR) – A Zenith Zodiac CH 650 (N419PE) made an emergency landing on approach. The sole pilot onboard received minor injuries. Philippines/ Kalibo Airport (KLO/RPVK) - AirAsia Zest Airbus A320-216 (RP-C8972) suffered a runway excursion while landing. US/ CO/ Denver/ near Centennial Airport (KAPA) – A Cessna 404 Titan (N404MG) impacted rural residential terrain shortly after takeoff killing the pilot. Brazil/ Belo Horizonte/ Anel Rodoviario – A Cessna 210L Centurion II (PT-JCC) crashed on the highway on approach. The plane hit a wall. The pilot was injured. Brazil/ Rio Grande do Sul/ Arroio Grande – An agricultural Embraer EMB-202A Ipanema (PT-UTX) crashed killing the pilot. Libya/ Al-Sedra oil port - Fajir Libya militia military plane downed by a MiG-23 fighter jet of the Libyan government. Libya/ Sirte - Libya Dawn (Fajr Libya) helicopter was shot down by the Libyan Air Force. US/ NV/ Las Vegas – A police McDonnell Douglas Helicopters MD530FF (369FF) helicopter (N530KK) crashed in a residential street. Both occupants sustained minor back injuries. US/ AZ/ Cochise County/ near Benson - An Airwest Helicopters Bell 206L-4 LongRanger IV helicopter (N57AW) crashed. The pilot and a mechanic aboard died in the crash. Malaysia/ Kampung Rambai/ Tanah Merah/ Kursial residential area – A police Aerospatiale AS-355 F2 Ecureuil 2 helicopter (9M-PHD) crashed while delivering food supplies to flood victims. The 4 occupants were injured, three of them seriously. Colombia/ Puerto Salgar (Cundinamarca) – An IAI Kfir TC.10 fighter jet (FAC3041) crashed on approach. The pilot ejected safely. US/ ND/ Fargo/ Hector International Airport (KFAR) – A Cessna 210K Centurion plane (N8229M) experienced a gear-up landing. No injuries.